SMPS Consultants based in Ahmedabad is known to be a leading organization of consultants offering comprehensive services in planning and design engineering for diverse types of industrial and institutional infrastructural projects.The company was founded by was founded by Sh. Sukumar M Parikh; an MIT graduate, in 1963. Since its inception, SMPS has accumulated diversified experience in traditional industries and technologies - textiles, glass and ceramics, foundries, amongst others and has kept pace with sunrise industries and modern technologies - electronic industries, pharmaceutical plants with ultra - clean environments and speciality chemical plants. With personnel of over 94 technologists, project managers, designers, supervisors, draftsmen and other specialists, SMPS strives for continuous improvement in its capabilities and increase its reach of services. do business. But we came out with flying colours and soon became a well-known name in West India. We became the first player to provide concept to commissioning services for almost all type of industrial units,” informs Mr. Atul Upadhyay, CEO. "Incorporated with BIM (Building Information Modeling) way of working through latest design tools and software; with over 90 Technologists, Project Managers, Designers, Supervisors, Draftsmen and other Specialists; SMPS remains deeply committed to the highest ideals and ethics of professional practice." Best known to command over a comprehensive range of services across wider range of projects and industries, SMPS provides a complete range of services for setting up an industrial unit. Planning, Design, Engineering, Procurement, Execution and commissioning which are the major functions of any Industrial Project. The company takes up responsibility and accountability for all of their projects. 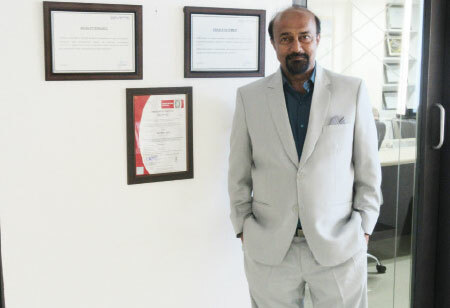 “We cater almost all kind of industries, but specialize in Textiles, Petrochemicals, Glass and Metal, Agro and Food, Pharmaceutical, Machinery and manufacturing.” he says. Apart from these basic services, SMPS has introduced an integrated service known as “One Office BIM”. Through this, the entire service offerings will be provided under one roof through latest BIM Software and tools so that co-ordination and planning become fast and deliverables are on time. An industrial project requires Architectural, Structural, civil, MEP, Electrical, Fire Fighting, Safety, HVAC as sub engineering divisions. “There are very few players who provide all services without outsourcing the work, and out of these very few provides all services under one roof,” he adds. With over 90 Technologists, Project Managers, Designers, Supervisors, Draftsmen and other Specialists SMPS remains deeply committed to the highest ideals and ethics of professional practice. This enables them to provide unbiased expert opinion and technical advice. In a nutshell, the company has been consistently achieving - well coordinated planning, optimal & functional Design with Fast Track Implementation since 1963.